The band U2 has teamed up with a collective of street artists from Haifa in Israel for its latest video, released today. The psychedelic and pop style of the group called Broken Fingaz has become more political following the 50-year anniversary of Israel's 1967 war and occupation. 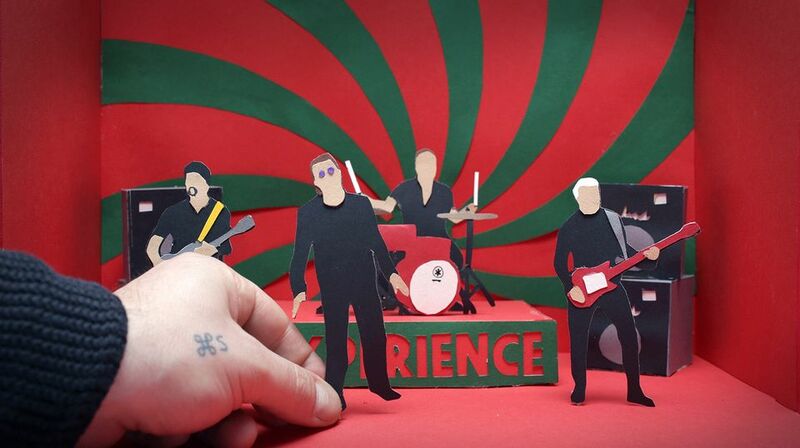 In their second video for the band, Broken Fingaz enjoyed free rein to produce and illustrate the video for the song Get Out of Your Own Way from U2’s Songs of Experience album, released on 1 December. Bono, U2’s lead vocalist and lyricist, penned the song as a letter to his daughters. The artists, who have never revealed their given names in public, animated the video with the editor Adam Albo using a series of still photographs of two- and three-dimensional paper cut-outs. The flat pop images they created range from the Ku Klux Klan to Donald Trump with a rainbow flag in his window, based on the lyrics and conversations they had with Bono, the artist known as Unga says. Formed in 2001 as a group of local graffiti writers, Broken Fingaz was considered racy in Israel for its psychedelic sexual imagery and social commentary. After years of working internationally, the artists’ symbols recently became more strongly aimed at Israeli politics. 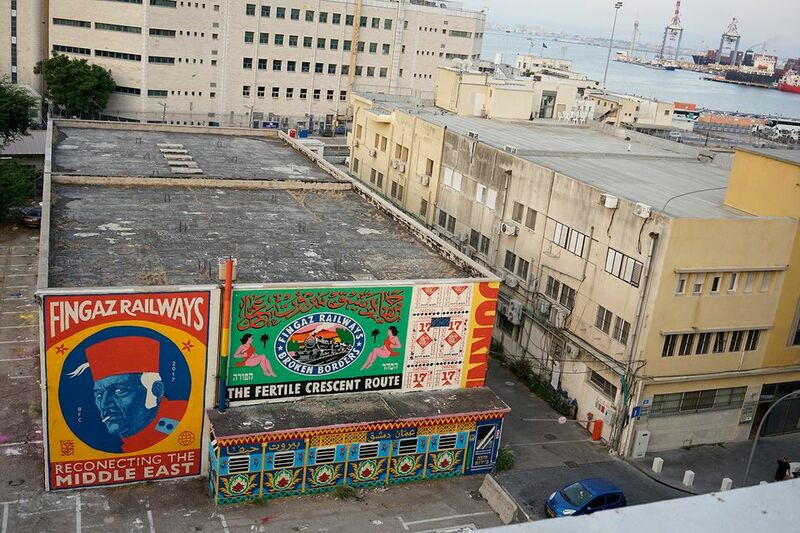 Back home in the port city of Haifa where they grew up, a recent mural project has opened a dialogue about the Jewish and Palestinian citizens of Israel who have lived side by side in the city since 1948 but are forbidden from visiting relatives in many of the neighbouring Arab states. From 1905 to 1948 Haifa was a stop on the Hejaz Railway line that travelled from British and Ottoman Palestine to Lebanon, Syria and Saudi Arabia. Signs in Hebrew, English and Arabic point to stations across northern Israel today, though the cross-border tracks were destroyed 70 years ago. For the inaugural exhibition of international street and contemporary urban artists at Berlin’s Urban Nation Museum, on display now, the artists hand-painted a 72x115 cm. version of a book of stickers, inspired by the Israeli media images of conflict that they grew up with. Instead of traditional superheroes, they fashioned a Tai Chi symbol of Yin and Yang separated by a wall and a burning Israeli bus, a Palestinian father holding a dead child and generals from the headlines into pop art to remind viewers of Israel’s occupation. June marked 50 years since the 1967 Israel-Arab war, when approximately one million Arab Palestinians fell under Israeli military rule. The museum is purchasing the work for its permanent collection, curator Roland Henry said. 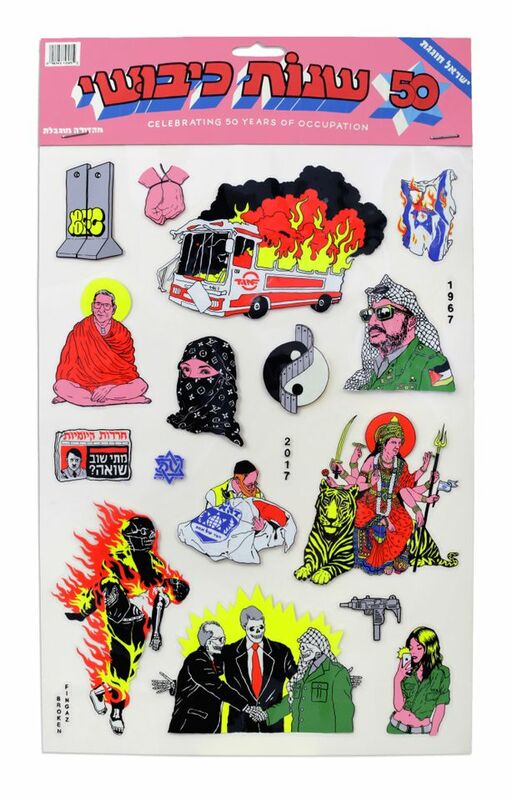 Broken Fingaz also produced the images into actual stickers sold apart from the exhibition; some of the proceeds went to joint Hebrew-Arabic education in Haifa.